Five years after the events of the first feel‐good musical comedy Mamma Mia! (2008), Sophie (Amanda Seyfried) is running her mother Donna's Bed & Breakfast villa on the fictitious Greek island of Kalokairi. Having recently given the villa a complete overhaul, Sophie is now setting up the final preparations for the grand reopening. Since other film critics have mentioned it before, I don't think it's still a spoiler to say that Sophie's mother Donna (Meryl Streep) is dead at this point. She passed away a year earlier of an unknown cause. Now, the story of how Donna first came to the Greek island in 1979 and met the three possible dads of Sophie is told through flashbacks and various dancing and singing scenes along the usual cheery ABBA songs. Back in the present, Sophie is joined by all the beloved characters we have already got to know in the first film: Donna's old uni friends and bandmates Tanya (Christine Baranski) and Rosie (Julie Walters), Sophie' sweetheart Sky (Dominic Cooper), and Sophie's three possible dads Sam (Pierce Brosnan), Bill (Stellan Skarsgård), and Harry (Colin Firth). Finally, Sophie's estranged grandmother Ruby Sheridan joins the celebrations and ageless pop star beauty Cher enters the Mamma Mia! stage. I don't know if it's true, but the rumour was that the film crew changed the film locations from Greece (where the first Mamma Mia! film was shot) to Croatia because it was cheaper to film there. 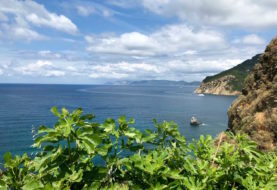 And maybe I am a bit biased because I have just been to the Greek islands of Skiathos and Skopelos a few weeks ago in June 2018. But the film locations in the second movie didn't exactly blow me away. There weren't any beautiful beaches like Kastani Beach in the first film. Yes, there were the boat scenes with the same stunning blue sea views. But that was about it. Nevertheless, the second Mamma Mia! 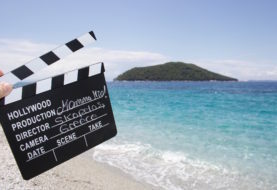 movie also adds a new destination to the travel bucket list of film fans and I'm sure that the Croation island of Vis (where most of the filming for Mamma Mia! 2 took place) does have its perks, too. For more travel tips on Vis, check out this post by Condé Nast Traveller. The little chapel on the rock (where Sophie and Sky are supposed to get married in the first film) is the only reoccurring original film location. You could see though that the scenes from the first film were simple cut into the second film. The scenes for when the characters reach the top of the rock and go into the chapel were filmed elsewhere (either in Croatia or in a studio). When it was first confirmed that a Mamma Mia! sequel was underway, I got really excited. After I've seen it, however, I would have preferred a different storyline. The fact that Donna is dead is just too sad. Although I can understand why the writers did that. After all, this is what happens in real life. And the real life, like we all know, isn't always as happy and carefree as a jolly musical film. The newly joined actors (Lily James as young Donna, Jeremy Irvine as young Sam, Hugh Skinner as young Harry and newcomer Josh Dylan as young Bill) did a really good job, too. Finally, the musical performances were just as great as the ones in the first film and there were some fun cameos from the original ABBA members Benny and Björn. 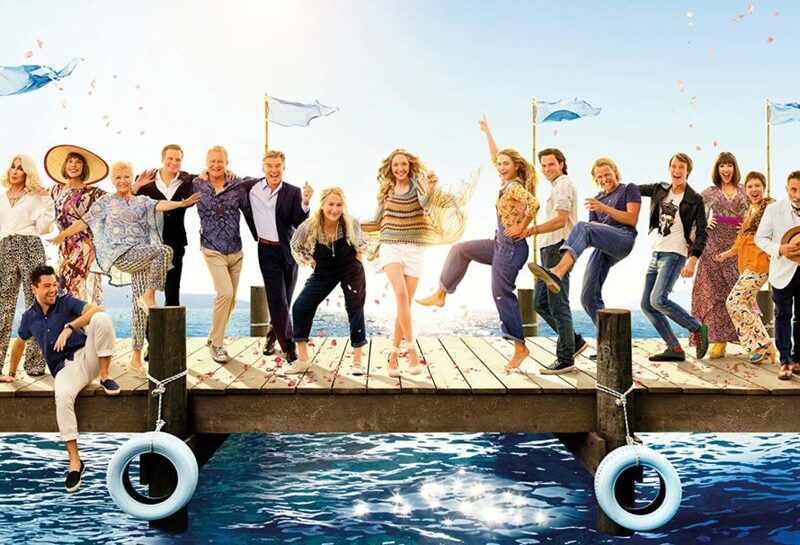 The final verdict: Overall, a good enough sequel to check out if you like cheerful musical films, but don't expect a super trouper feel‐good movie like the original one was. Travel Tip: If you would like to see the stunning filming locations of the first film in Greece and maybe go on the dedicated Mamma Mia! Film Locations Tour on the island of Skopelos, you will find all you need to know in my recently updated Greece travel posts section. 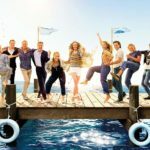 What do you think of the Mamma Mia! sequel? Worse, better or just as good as the original?